The ASP.NET Report Designer is a web reporting tool used to create and edit simple to complex RDL reports. 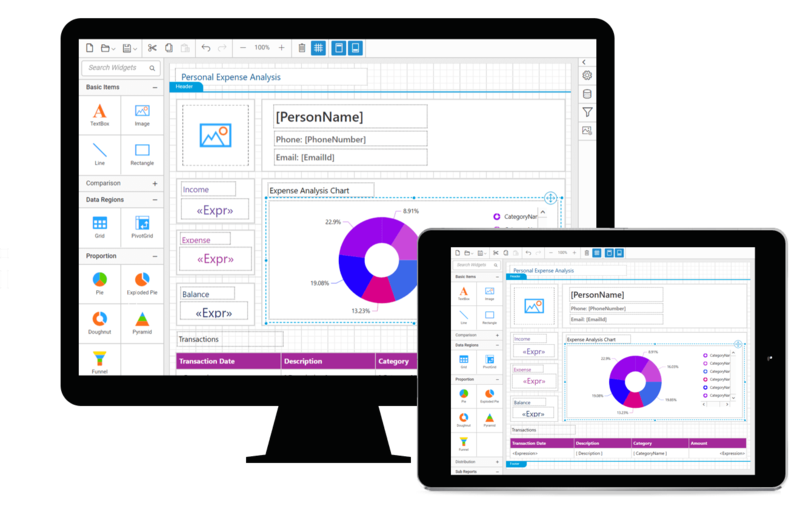 The web-based Report Designer makes it easy to integrate an intuitive run-time RDL report editing and customization into your web application. The ASP.NET Web Forms Report Designer is a web reporting tool used to create and edit simple to complex RDL reports. The web-based Report Designer makes it easy to integrate an intuitive run-time RDL report editing and customization into your web application. It lets you create reports with reporting features such as parameters, expressions, sorting, grouping, filtering, report linking, hyperlink, and more. You can preview and export the report to PDF, Excel, CSV, WORD, PowerPoint, and HTML formats. The ASP.NET Report Designer provides an option to preview the report and verify whether the created report displays what you require. The ASP.NET Report Designer allows you to save a report to Syncfusion Report Server or SSRS Report Server and to your computer. Publishing a report to the server allows other users (who have permission to access the server) to view it.